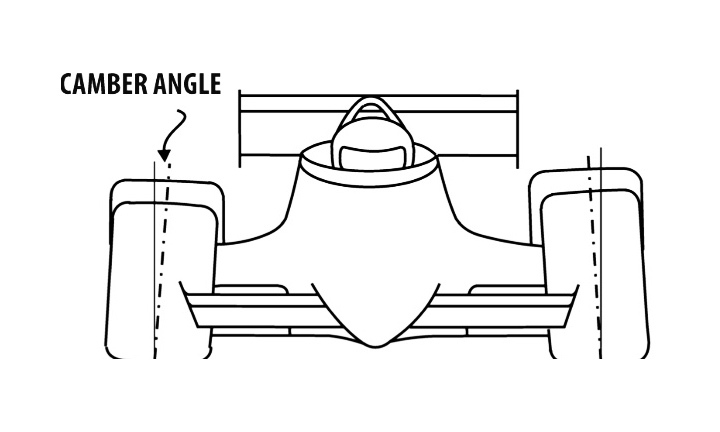 If you’ve ever had the good fortune of ogling a race car in a paddock, or watching one trundle down the pit lane in your direction, the unique “angle of attack” of the wheels and tires might have caught your attention. In strong contrast with normal road cars, the wheels/tires of race cars are often angled sharply inward at the top of the tire. When stationary or driving in a straight line, the contact patch of the tire is focused on the inside half (or even less) of the tire. This is called negative camber. So what’s negative camber all about? 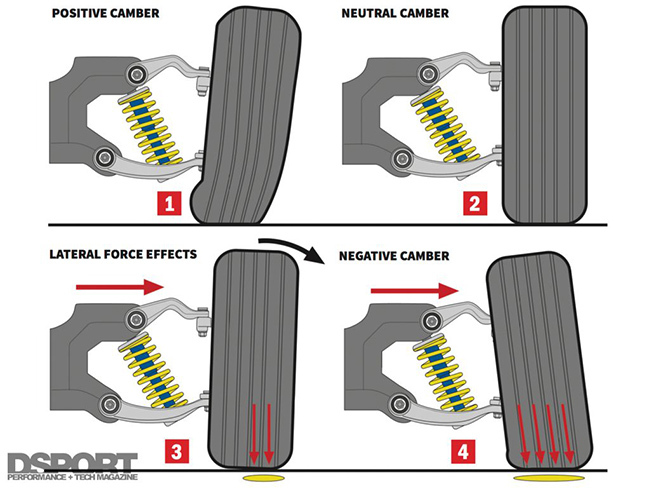 Why run negative camber, and what effect does it have on tire and vehicle performance? When the car is in a static state, or driving in a straight line, the performance benefits of negative camber might not be altogether clear. To optimize traction, isn’t the idea to maximize, not minimize the tire contact patch? Precisely. Negative camber maximizes the tire contact patch when it’s most needed in a performance driving context – under load, during hard cornering. When cornering aggressively, the weight of the vehicle transfers to the outside tires. 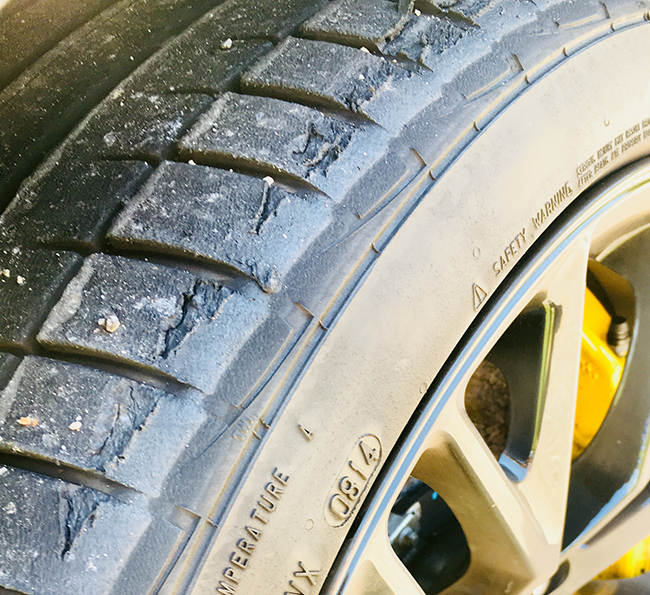 If the tires are in a neutral or positive camber state, the shoulder of those outside tires will bear the brunt of the vehicle weight transfer and cornering force. This results in both less-than-optimum grip through the corner, and premature, uneven tread wear. With an appropriate amount of negative camber, the tire ideally achieves a 0-degree camber (flat) state when cornering, with the entire contact patch of the tire in touch with the road surface. The cornering forces are also focused more upward, or vertically into the tire, as opposed to the lateral shearing effect that occurs with a positive or neutral camber setting. More stability and a wider contact patch when cornering = more grip. 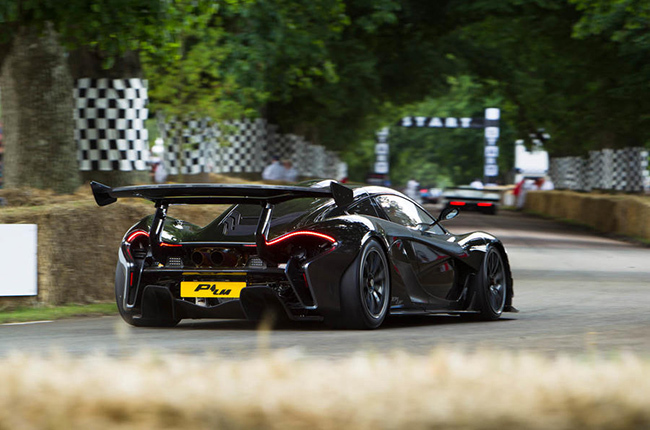 More grip = higher cornering speeds and reduced lap times. If you participate in performance driving events, the added benefit of negative camber is it helps prolong the life of your performance tires. If camber is neutral or positive, repeat hard cornering will put the outside shoulder of the tire under extreme stress, and premature wear (and tread damage) can result. Once structural damage occurs, the tire is expired no matter the tread condition and depth elsewhere. Stroll the paddock at just about any track day and you’ll find examples of vehicles with “stock” (near neutral) camber settings doing a number on the outside shoulders of tires. Negative camber not only benefits cornering traction and performance, but also tire longevity when used for performance driving. 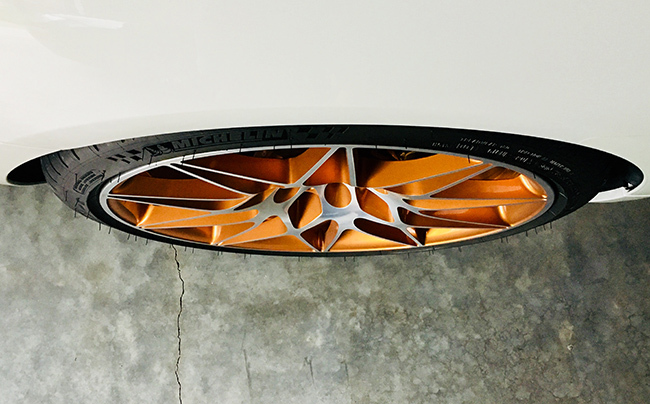 However, if tires are used conventionally, (primarily street driving), then strong negative camber will have the opposite effect – the inside half of the tire carries the load, and premature, uneven tread wear will result. Therefore, finding the right amount of negative camber for your vehicle and driving activities is key. There’s no universal rule as far as ideal negative camber values. Top-down perspective of mild negative camber. Some dual purpose (street and track) performance vehicles are offered with significant camber adjustability, as well as recommended street and performance driving (track day) alignment settings. For performance vehicles that aren’t equipped with meaningful camber adjustability in stock form, camber plates that allow for greater negative camber are a common aftermarket upgrade. 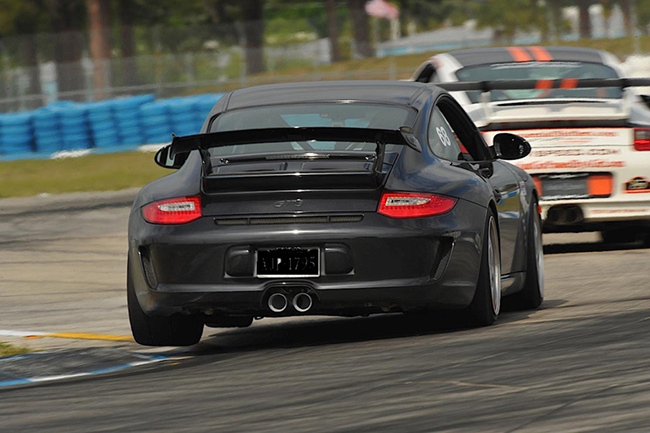 For track days and performance driving, you’ll get the most performance and life from your tires with an appropriate amount of negative camber. But before adjusting negative camber, be sure to talk with an alignment professional (preferably experienced with your vehicle), and understand the influence that additional negative camber will have on your vehicle’s handling characteristics, suspension components, and tires. 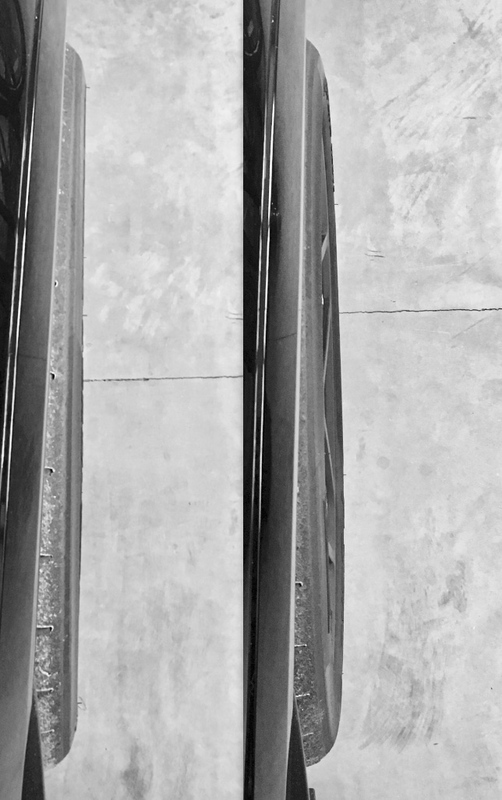 Top-down perspective of negative camber adjustment - before (left) and after (right). Explore our selection of motorsport tires and ultra-high performance tires, or talk tires with one of our experts! 1-866-961-8668. Got your eye on a set of motorsport tires? First you should know how long they’ll last. UHP tires can significantly improve your ride. Are they as awesome as they sound?